This adjustable standalone steel backiron can be used in conjunction with our 12" (Item No. FA312I)and 18" (Item No. FA518I) Removable Figure Armatures or an armature of your own design. It is not compatible with our 24" Removable Figure Armature. 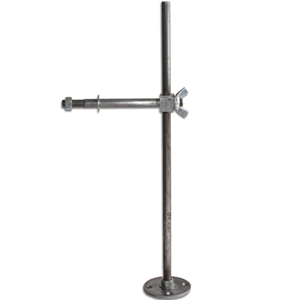 The backiron stands approximately 14" with a crossbar of 5 1/2" in width; its base has a 2 3/8" diameter to be attached to a sturdy base of your choosing. If using moist (ceramic/pottery) clay, please note, the backiron cannot be put in a kiln during firing. The clay will shrink but the backiron will not, resulting in cracking and/or breakage. We suggest using a wet and twisted newspaper armature as the paper will burn off during firing; or a wax armature as the wax will melt during firing.